So, I have been getting some stuff done. I have completed 3 of Brady Gaga’s 4 new blankets! Yay! I think they turned out pretty good. Making the edge tape (not bias tape, as it is not cut on the bias, but doesn’t need to be since there are no curves) is probably the most time consuming part of all. Once it gets made, all I have to do is pin the edging tape onto the edge of the blanket fabric, and then sew. Luckily the blankets are all folded up so no one can see how not quite square they are. I need to get some quilters tools to help me square up the main piece of fabric. I have seen some large, clear and wide rulers that have a grid on them – I think that is what I need. Anyway, BG won’t mind – s/he’ll stay nice and warm swaddled in the blankets! I am also up to my ears in freezer paper stencils – darn my mommy friends for being so kind! These are little Valentine’s day treats for their little ones – I won’t post a picture until I they have been given out. 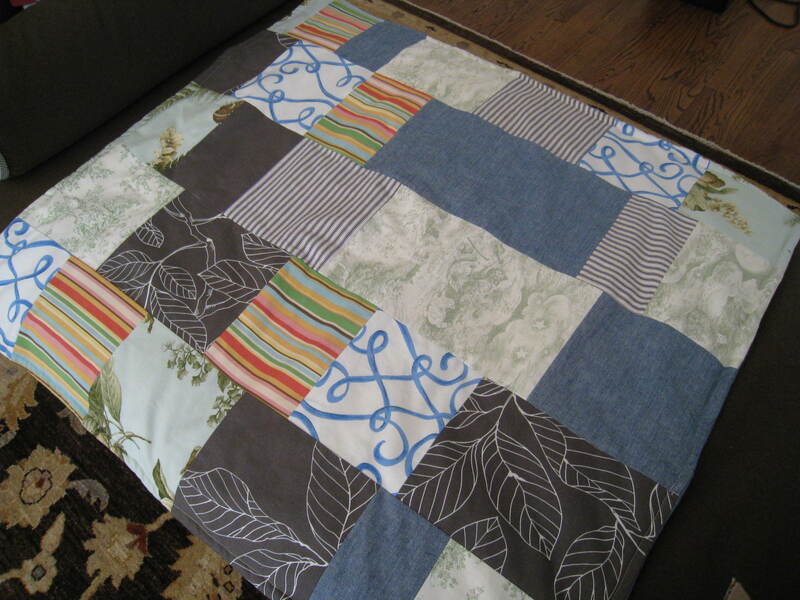 And I have decided that I need to make BG a quilt like the one Baby J has – that belonged to Boom. Boom’s mom made the “John” quilt over 30 years ago – so it is really a vintage heirloom! and I used it as the backdrop for Baby J’s monthly photos, so BG also needs a backdrop for his/her monthy photos. 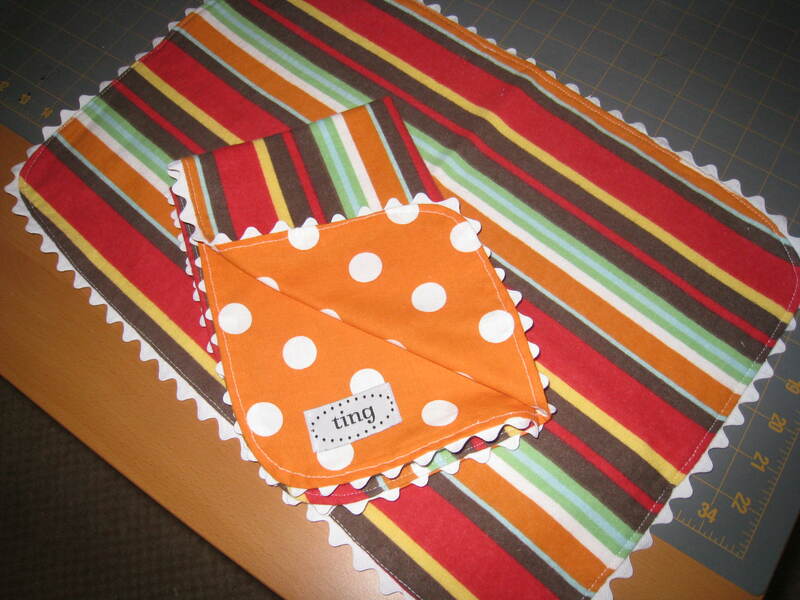 I think I am going to make a bunting quilt similar to this one, but I will leave a spot at the top for BG’s name. So I can get all the buntings on the front fabric, make the edging tape and have the backing ready, but can’t put together until BG arrives and I have time (within the first month!) to applique his / her name on the quilt and sew it together. The solid yellow will be for the back – I think I want to have the back striped, so the yellow will be with another yet to be decided upon fabric. All the buntings will be polka dotted – tiny dots to big ones! and I just got a navy blue dot fabric today, so may add that into the mix. I think it is a good mix – very gender neutral, so it won’t matter if it is Brady or Gaga, and depending on that – the name can be in a gender specific color. And this morning Auntie Yarbs came over to say farewell – she is heading out on her 7 week Indian Mysore yoga adventure this afternoon! It will be an amazing experience! When she comes back, Baby J will be a big brother (and much bigger) and Brady Gaga will be here as the forth member of our family! So crazy to think that so many changes will take place in just a few weeks! Bye, Yarbs – have a great time, be safe and enjoy yourself! Soak it all in! Can’t wait to keep up via your bloggy blog! 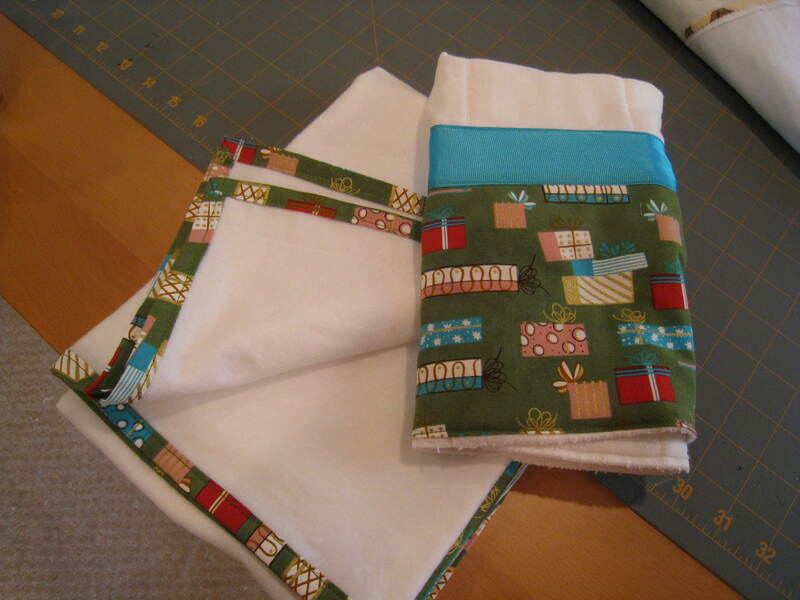 Blanket is flannel on one side and the cotton print on the other, with a rick rack trim. 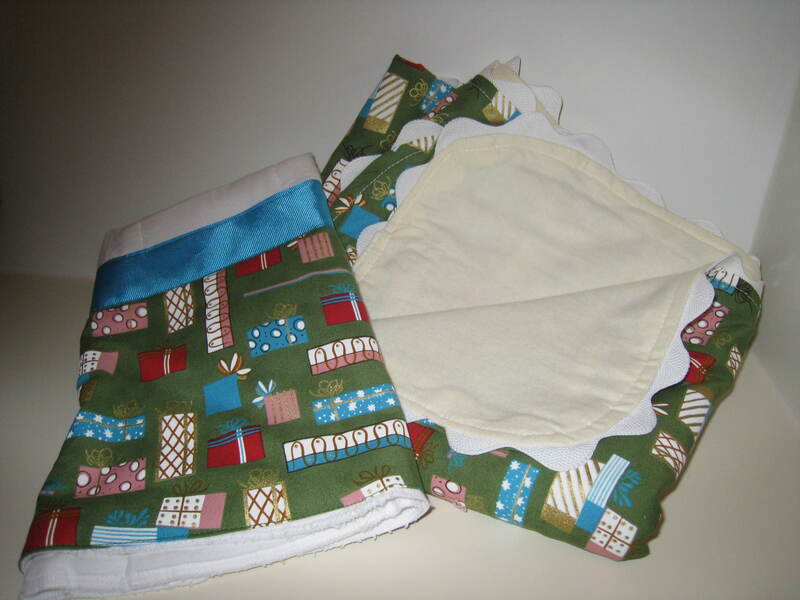 In this one, the blanket is a flannel receiving blanket, in which you could snug a baby quite well, with the trim being the matching cotton print. Both burps are the same. I love both sets, but will only keep one set for CM, the other will go off to a lucky friend! I think I will keep the top set, as I have already made quite a few flannel receiving blankets. The striped side is flannel and the polka dot side is cotton – with a rick rack trim. I also made another version of this, with rick rack on the flannel part, and no trim (but don’t have a photo). Here is the floor playmat I made for CM – I made it extra thick with 2x the bamboo quilt batting. 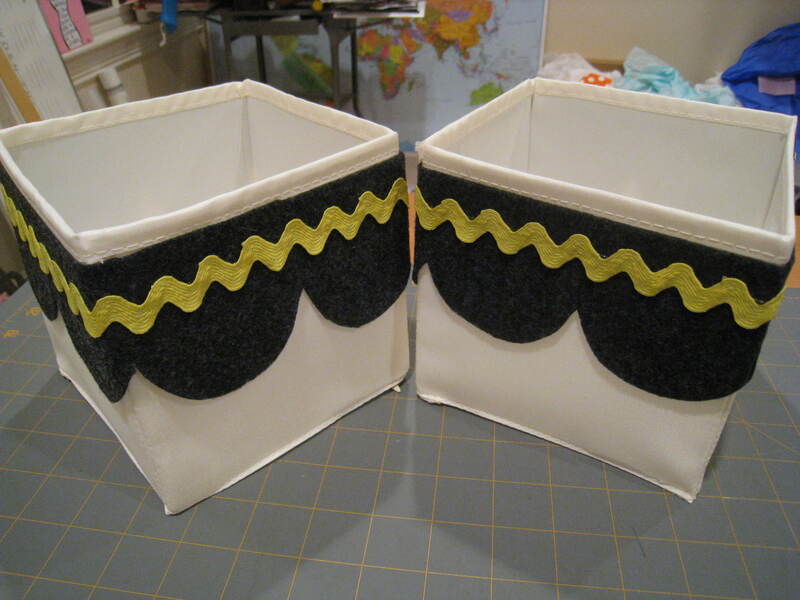 To make some plain bins much cuter, I decorated them with felt and rick rack. Much, much cuter! I guess I’ll use them to put random stuff in, maybe diaper changing stuff or bath stuff? I have cut out the bottoms for 2 extra large bins, which I think I want to have lower walls. 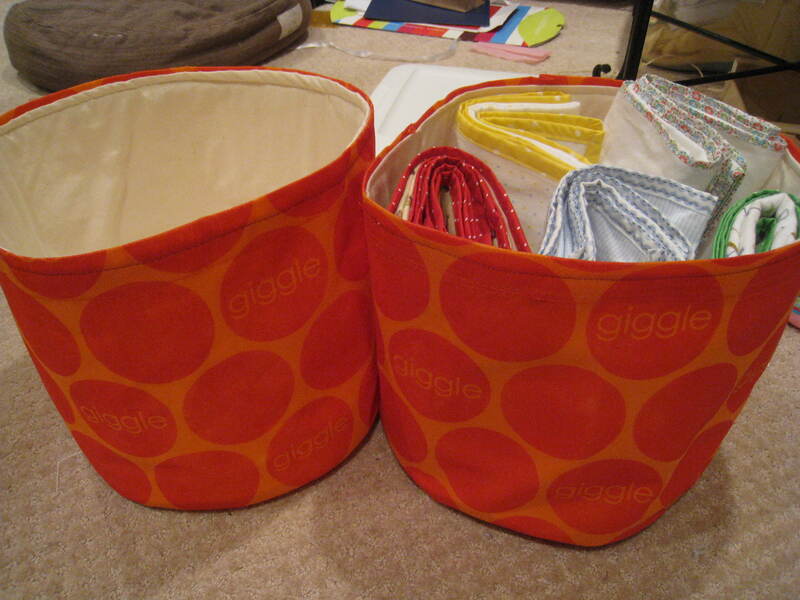 I could use those to put diapers and stuff in… Boom seems to think CM has plenty of buckets, so we’ll see. 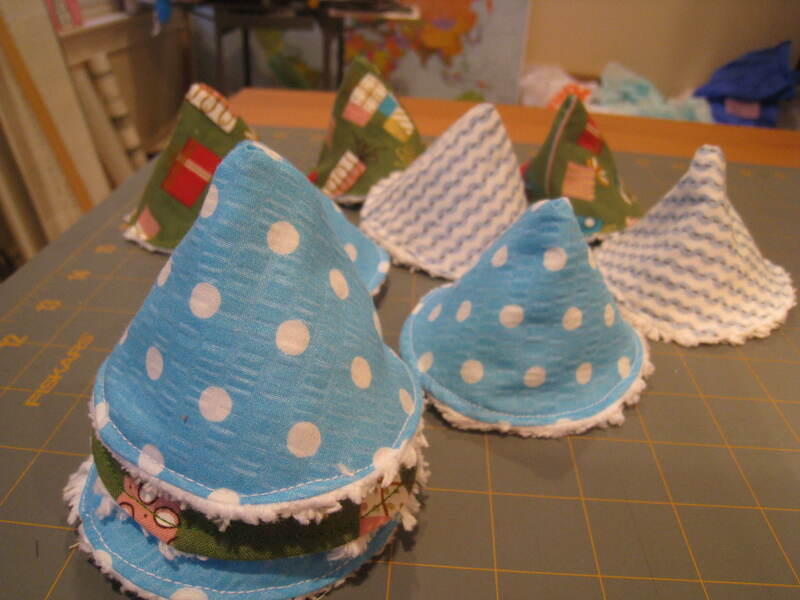 I also finally got around to making some Wee Wee Wigwams – many thanks to Make it and Love it blog for the free tutorial! Not to hard to make – since everyone I know is having boys, I will make these and put them in packs of threes for gifts. Whew – I’ve gotten a lot done, but there is still much more to do! and that doesn’t include all the non-sewing stuff that needs to get done… hopefully CM doesn’t decide to make a too early appearance! Friday we got our trestle table delivered – and it is the right size and color! We were more worried about the brown, but seems to work just fine. I thought the table worked well – and S (my friend and interior designer) came over on Sat morning to confirm. Which she did. Then we headed over to a huge lighting sale – they had tons of stuff! But would have been easier if I knew exactly what I wanted. Which I did not. But I did get 2 really big drum shade – we are going to hang them over the kitchen table. Will be a little modern, but I like to mix looks. I am loving drum shades these days! We could put 2 little chandeliers inside the drum shades, but every light fixture in this house doesn’t have to be super expensive or fancy. Cute, eh? And it involves no sewing, just roving (love that word! Means natural fiber yarns – wool in our case – that have been drawn out and slightly twisted in preparation for spinning) and stabbing with a very sharp needle. Imprecise, so good for Yarbs. I liked it as well, but just need to do some more to see if I really like it. Saturday afternoon Boom and I spent at the emergency vet, as Ruby was having some digestive issues. However, there were 2 critical cases that came into the ER so we waited for over 2 hours, and then just had to leave. We never did see the vet. (Based on personal experience, as I have had the exact issue that Ruby had – it is not considered an emergency!) So we just decided to keep an eye on her and take her to our regular vet on Monday morning. She has not seemed ill – her energy is normal as is her appetite. So we’ll see. Saturday night we went to a wine tasting party at my co-worker and friend’s home – it was a lot of fun! M & her sis were the hostesses, and everyone had a nice time. Learned some facts about wine and drinking (ex: the US imports more wine from Australia than any other country, over 60% of people in the US do not drink at all, etc) and got to talk with lots of interesting folks. Liza’s (or LB) old boss, Pat, was especially funny to talk to. and he was wearing some Chuck Bass pants – loved ’em! He suggested a new show – Opera Girl – and Liza and I thought that was an excellent idea! Sunday Boom and I went to yoga (I am so pleased that Boom comes to yoga now! It is good for him, and I am glad we can do it together!) – Yarbs was there as well. After class, we picked up some mini-donuts from Shipleys – quite good! Then Yarbs and I decorated my mini-forest of mini-trees (and 1 white 6-ft tree). I was afraid I wouldn’t have enough ornaments, but I think all the trees look great! The big white tree only has ornaments on the front, but that is ok.
Maybe some day we’ll get a real tree (a tall one! )- but I want to make sure we can rent a chipper, to chip the tree up after we are done with it to use it as mulch. Just throwing it away would make me feel way too guilty. Or maybe we’ll get a tree with a root ball, so that we can plant it after we are finished with it. But then it wouldn’t be very tall. Oh well, this year my lil’ forest of unusual trees is good enough. Off to stitch some more ornaments – I love working with felt! Update – Wed night I didn’t stay in – went to hear a lecture on the Dead Sea Scrolls with R, my friend from FWCDS (middle and high school). Then we went to Yia Yia Mary’s Greek Kitchen for dindin – it was quite good! Another restaurant from the Pappas family. I was actually exhausted that night – had run 6 miles that morn and then rushed home from a busy day at work to go to the lecture. But really great to see R and hang out a bit! Time has just been swirling by! This week after Thanksgiving has just been full of activity (not all of it fun and games).. So Monday after work I was on the hunt for some jars. I am making some sugar / salt body scrub from a recipe that was in Martha’a latest magazine. It looks easy and really cute! The jars I got are not exactly like that, but still cute nonetheless. Hopefully the end product will be one that would make Martha proud! I am planning on doing this project tomorrow – as I need 2 tomorrow night for hostess gifts for a wine tasting party Boom and I are going to. I may also make this for other folks – depends on how everything goes tomorrow. Tuesday night I had to go to the grocery store – the worst errand in the world! I hate going to the grocery store – but we had nothing edible left in the house! I think they are so cute (sorry the photo is sideways)! So whenever I have any down time at home, I have been ornament making, not blog reading or writing! Thursday I had 2 happy hours to attend, from 4-6 and then the other one until about 8pm. Was good, but tiring and sometimes I’d rather just lounge at home with Boom and Ruby. Not a good attitude, so I combat it, but still. Tonight some guy has invited Boom and I to his Christmas party, but I am thinking I want to just hang out at home. If Boom really wants to go, of course I am happy to go, but we have a long(ish) run on Sat morning, and lots of things to get done on Saturday. So we’ll see. Saturday Yarbs and I are taking a needle felting class at Sew Crafty – I am really excited! Hopefully it will be good, as there is a class in Jan that I am interested in taking as well. And Yarbs is gonna take our Christmas card photo on Sat, then the wine tasting is that night. Good stuff! Christmas will be here before I know it! Marm and dad will be down here for a week – so that will be really great. I can’t believe how little clothing costs as I just experienced what a pain it is to sew ’em… And I have a whole new appreciation for Project Runway – it is hard enough using a Sew Easy pattern, let alone make your own design! I can’t even imagine. Though I am hoping to get good enough to alter basic patterns to make them more of what I want. Clearly that is long way down the road. So anyway, recently I’ve been inspired by my co-worker, M, who made a gorgeous shirt – loved the fabric and the shape and style of it. So I decided that I could and should should sew my own shirt. I went to Jo-Anns a few weeks ago when patterns were on sale, and got a couple patterns. I actually got the pattern than M made – and another one, similar but still different. What I looked for was no zippers and no buttons. Going to the Jo-Anns by my house is running the risk of catching the black lung or some other horrible sickness – it just seems so dirty and ripe for something bad, like mold. Still I go there, when I must as there is little other choice. Today, since Boom was headed out to Charlotte in the late afternoon, I decided I should go to High Fashion Fabric to get some fabric for my to-be-made shirt. Good thing Boom did not come with me – it is a huge room full of bolts of fabric. A wee bit overwhelming. I was wandering around in a daze when I realized I needed to pull it together! I knew I wanted a stiffer fabric – something that had a little body to it. And I didn’t want to spend a ton of money, since this is my first attempt at a shirt. And nothing with too much of a pattern. I finally ended up getting a purplish – navy fabric with same tone tiny polka dots. Has body like a silk shantung, but is made of polyester or something like that. and it was only $8.99 a yard! I got 1 1/2 yards (good thing I got a little extra!). Pattern (4 pieces), instructions, thread, fabric and hook & eye closures. I did also have to use my computer, as it called for slip stitching to attach the collar to the shirt. Since I had no idea how to slip stitch, I turned to Ms. Internet for some help. and of course she obliged. Not too shabby, I think, for my first shirt ever. I still need to hem the bottom and then put the hook and eye closures in the back, but you get the basic idea. Don’t look too closely either, as there are mistakes and I am not entirely sure I put the collar on correctly. Oh well. I am thinking it may be a little big, but maybe that is just it’s boxy style. I think it will look cute with my black velvet pants! It took me less than 5 1/2 hours to make. I cut a few of my pieces out incorrectly, so had to re-cut them. I did cut out the pattern earlier, so I guess it really took me less than 6 hours to make. I would like to find a pattern that uses elastic – maybe with puffed sleeves? I also am a bit perturbed by the raw edges on the inside – need to think what I can do to contain the stray strands of thread and to keep the fabric from unraveling. Once I finish this shirt, I’d like to wear it everyday. Don’t think I will, but I will likely look at it everyday, for a week or so – will make me happy to know that I made it! I never really had any experience with advent calendars (since we are not religious) and I am not exactly sure when I started hearing about them (opening the calender’s “door” for each day and getting a piece of chocolate! ), but I thought I would make one for Boom and myself. Boom encouraged me to just purchase this one and luckily I decided to – it arrived and I just had to put it up! I had a lot of felt on hand, so I thought that I could use it up making felt ornaments. I even purchased a felt ornament pattern from futuregirl of sea creatures (fish, octopus, etc.) but I really didn’t ENJOY using the pattern. After that, I even went as far as to email Yarb and tell her that this year I wouldn’t be able to give her any ornaments, as my plan had gone awry. So maybe that is how my holiday spirit has manifested itself – via making felt ornaments.